Costumes are a way of life around the Little Pink House. I cannot tell you how many times we end up needing a costume for some random event and most of the time, we can fulfill what ever costuming need right out of our ever-growing costume box(es) but historical costumes, well, that's where we are lacking. As an example, the sixth grade class at Diva's school always has a Renaissance Fayre which is such a neat holistic approach to learning. They will have to be a famous person from the Renaissance write a speech, create an invention, reproduce a famous painting, create a fable and write it in illuminated text, the list goes on and on. Diva's teacher thought she would be a perfect fit for Gutenberg. Johannes Gutenberg, not Steve Guttenberg. I could have come up with a costume for Ol' Steve no problem. 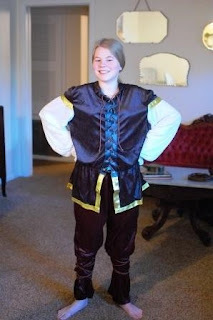 Lucky for me, the good folks at Anytime Costumes needed someone to review Renaissance costumes. Woo-hoo! What timing! After doing a little research on the history of costumes, we worked out that this "Tavern Man" look would be best for the Gute-meister but I may have to add a fluffy collar and a hat...I'm sure I can rustle up a hat. The costume looked like it did in the photo on their site and I was happy with the weight of the costume. It's very light and since Diva has to wear something under it anyway, it makes it more comfortable. I liked the versatility of this costume as well (it's very likely we will need it again in future) and I can see it as Gaston from Beauty & the Beast or Robin Hood using slightly different accessories. Anytime Costumes have a wide range of prices and selections. And who doesn't like the ease of ordering online? 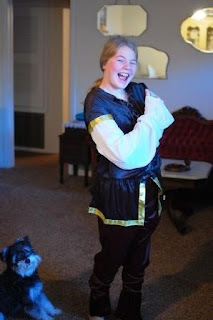 The costume was also Diva (and Greta) approved. I was sent a costume by Anytime Costumes to facilitate my review. All opinions, necessity for an inordinate amount of costumes, and cheesy kid are my own. I wanna dress up too!! These look fab! 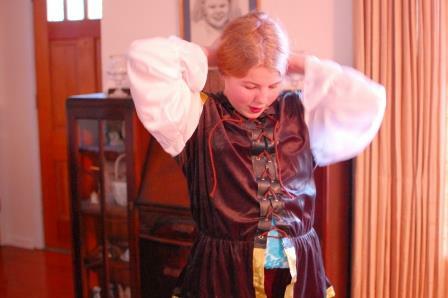 I always loved medieval costumes! I had something a little medieval when I was fiona from shrek a few Halloweens ago.